- Publisher What can God really do with a broken life? When a person sincerely returns to God and obediently places his life in His hands, literal miracles can happen! Re-discover the loving Father-heart of God through this dynamic testimony. You too can be touched through God's powerful revival. 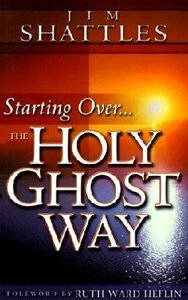 About "Starting Over..The Holy Ghost Way"
What can God really do with a broken life? When a person sincerely returns to God and obediently places his life in His hands, literal miracles can happen! Re-discover the loving Father-heart of God through this dynamic testimony. You too can be touched through God's powerful revival. Shattles is the Senior Pastor of Souls harvest Worship Center in Douglasville, Georgia. He attended Jacksonville Theological Seminary.